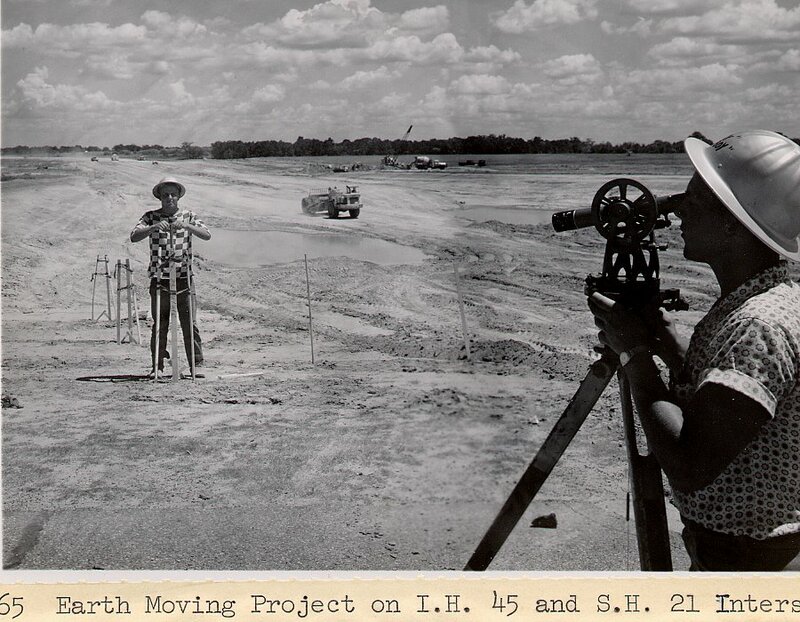 The Inner Space Cavern cave was discovered during construction of this section of IH-35. I'm not 100% certain, but this looks like exact location of the cave. 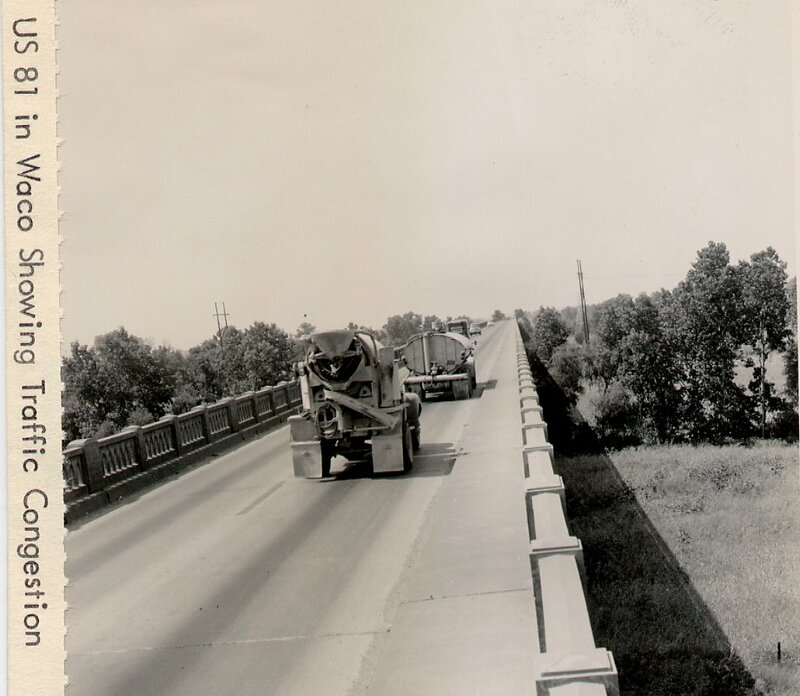 This bridge was widened in 2001. 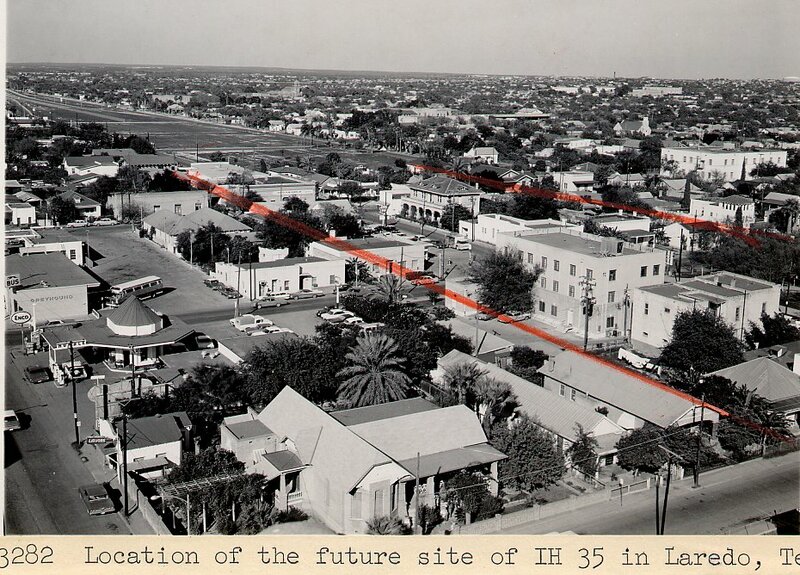 The red lines in the view show the path that the freeway will take. 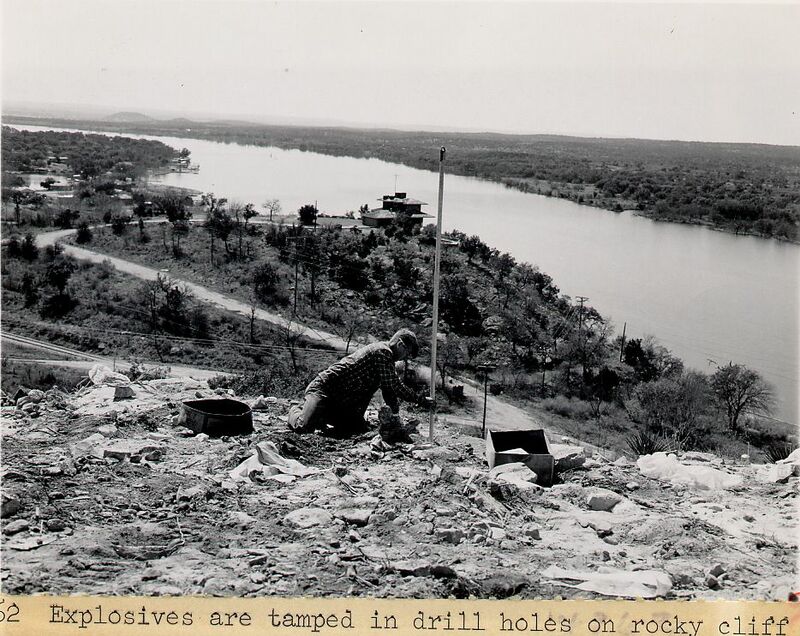 The Rio Grande Rivers appears to be in the background. 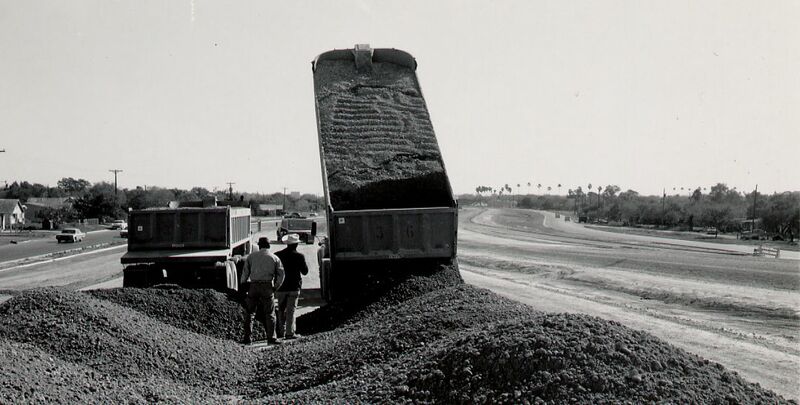 This quiet village has become one of the busiest US-Mexico Border Crossings. 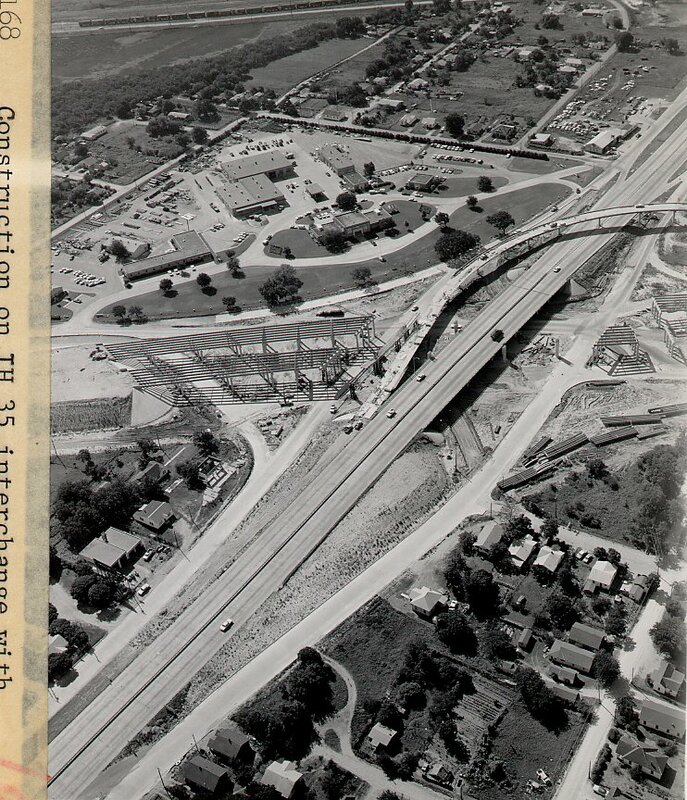 The red lines in the view show the path that the freeway will take. 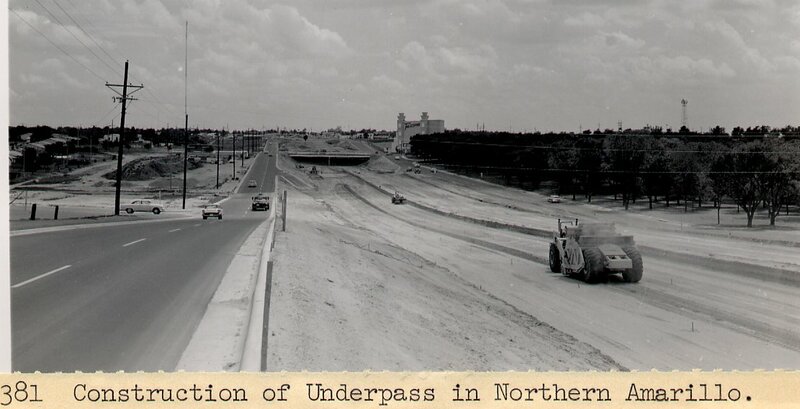 Looking north, the right of way of the freeway is already clear, with feeders in place. 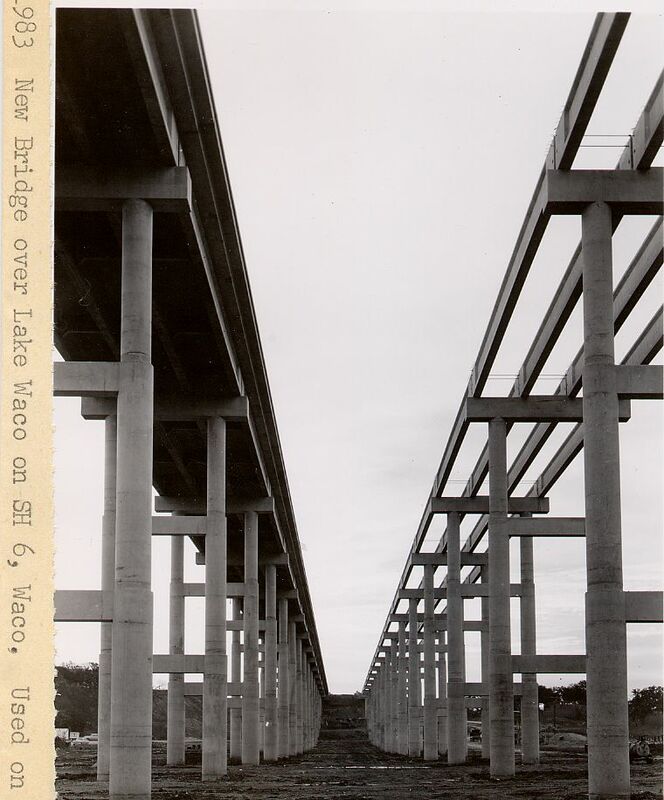 This image from the inside cover of the February, 1970, Texas Highways Magazine shows the nearly complete freeway through Waco, with the Brazos River crossing in the foreground. 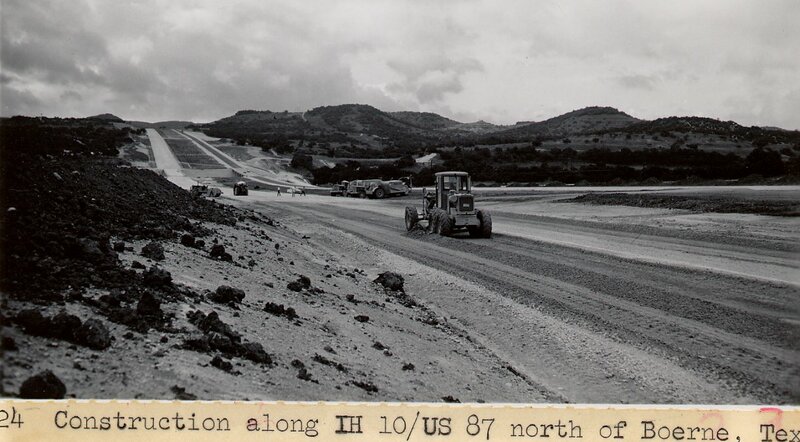 Interstate 10 in Texas was completed on May 20, 1983, when the Fort Stockton bypass opened. 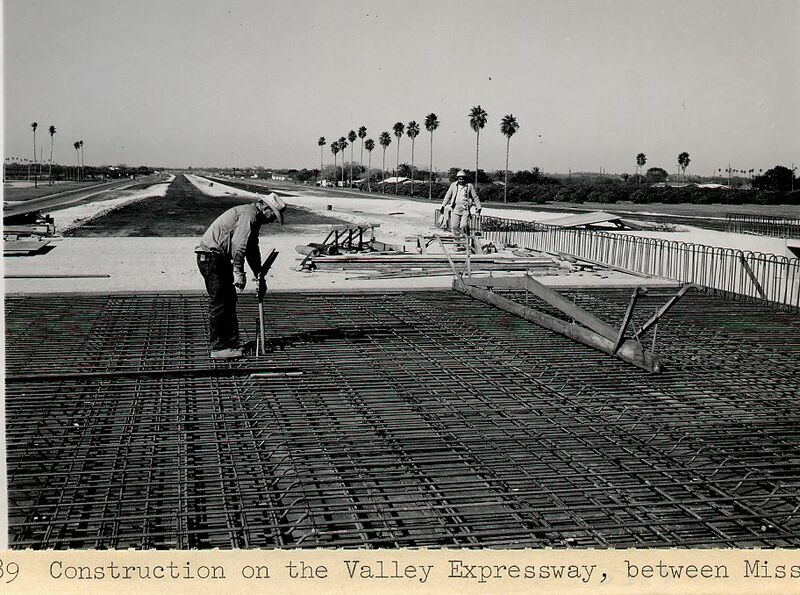 On that date, Interstate 10 became a limited-access facility from coast-to-coast, although the freeway did not yet follow the officially designated route through Phoenix, Arizona, where it would be built in a cut-and-cover tunnel. 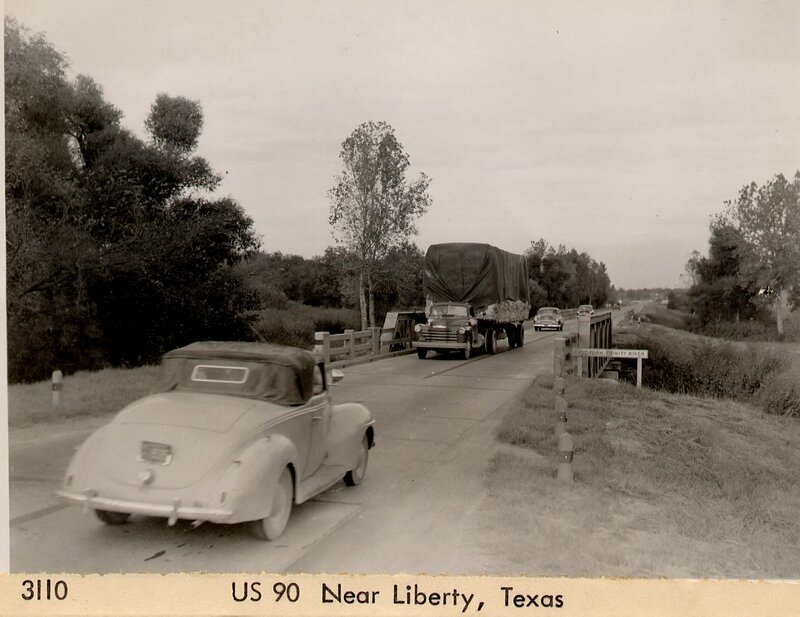 US 90 was the predecessor of IH-10. 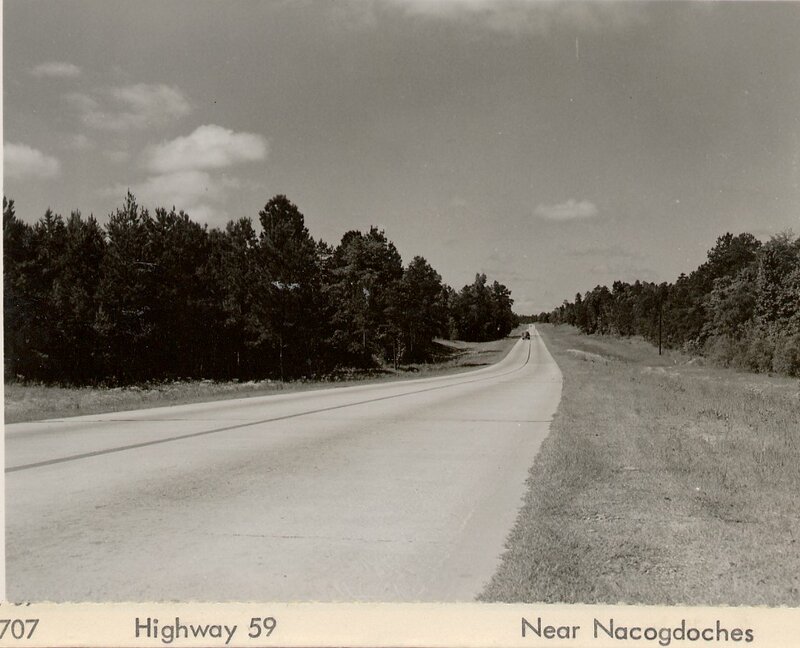 The present IH-10 does not follow this section US 90, however; a more southerly route was taken for IH-10. 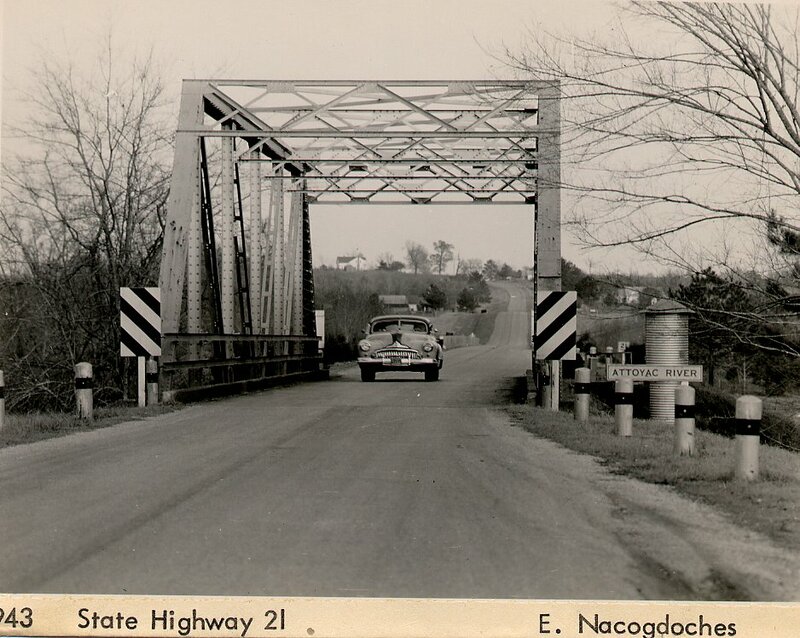 Notice the very narrow bridge in this photo. 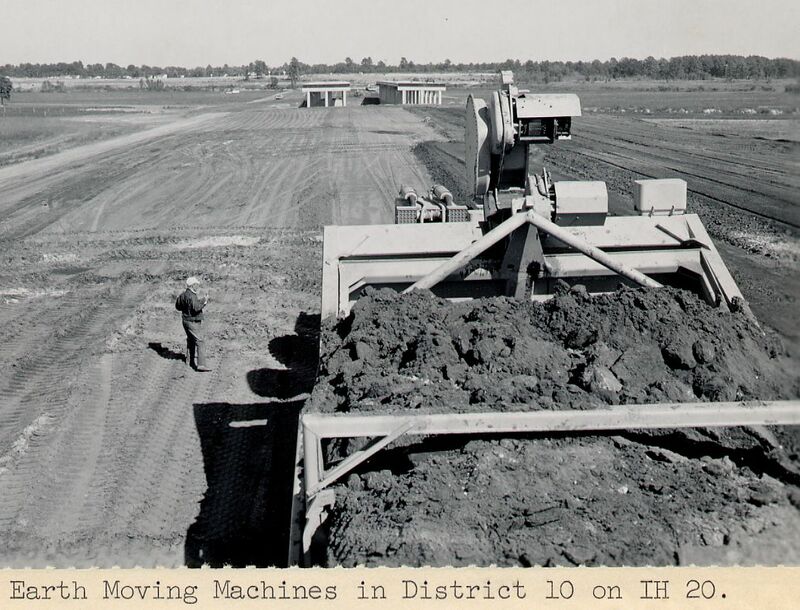 This section of IH-10 traverses the Blue Elbow Swamp. 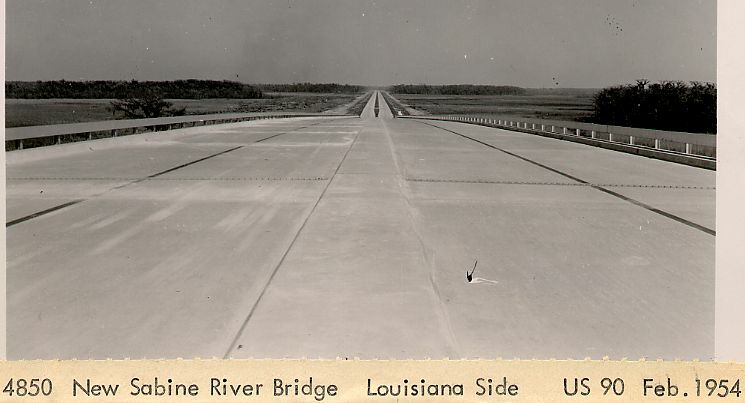 Based on the shadows, this photo appears to be looking into Louisiana. 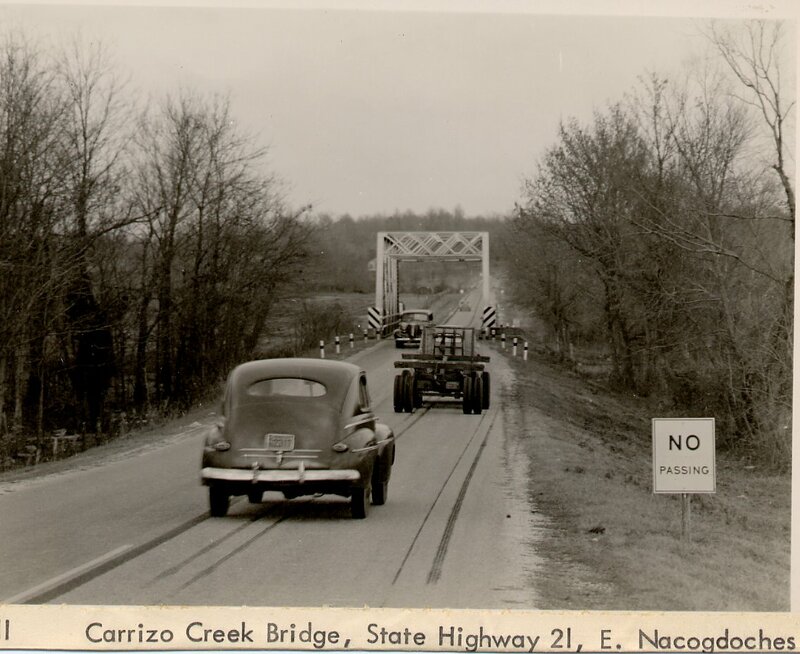 Notice how narrow the bridge is. 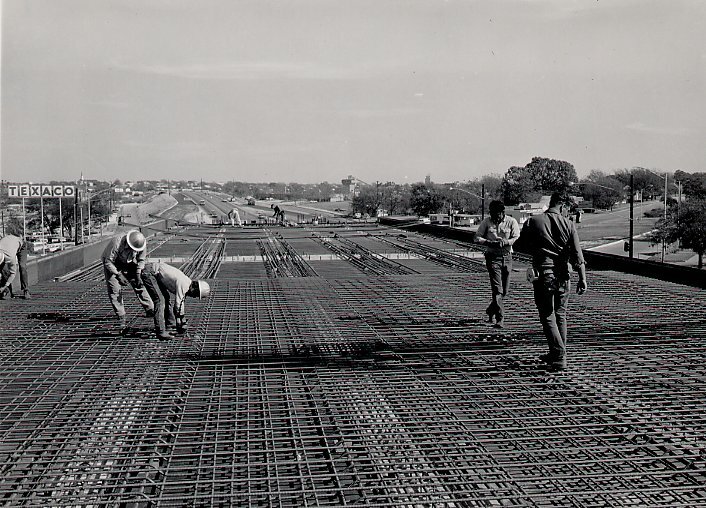 In 1999, construction began on a $39.35 million, 6-lane replacement bridge. 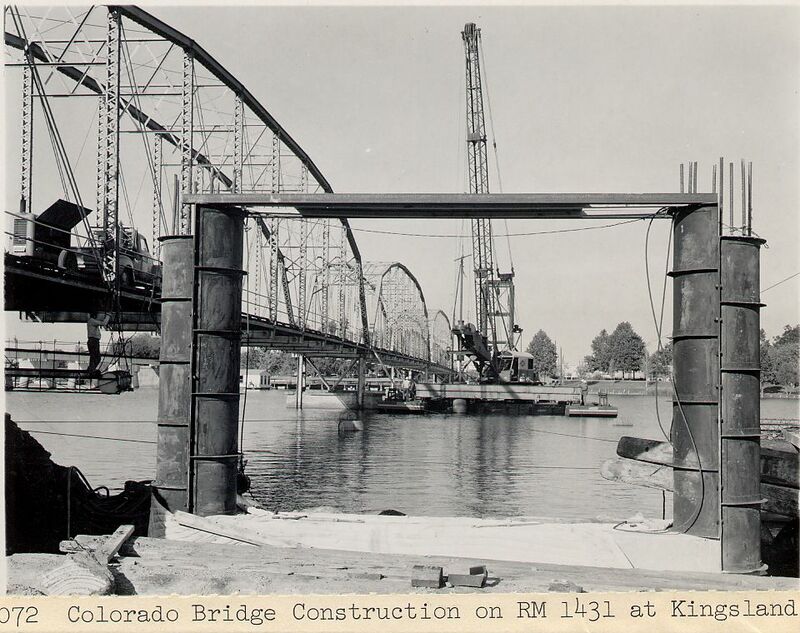 As of January 2001, the new bridge was 45% complete. 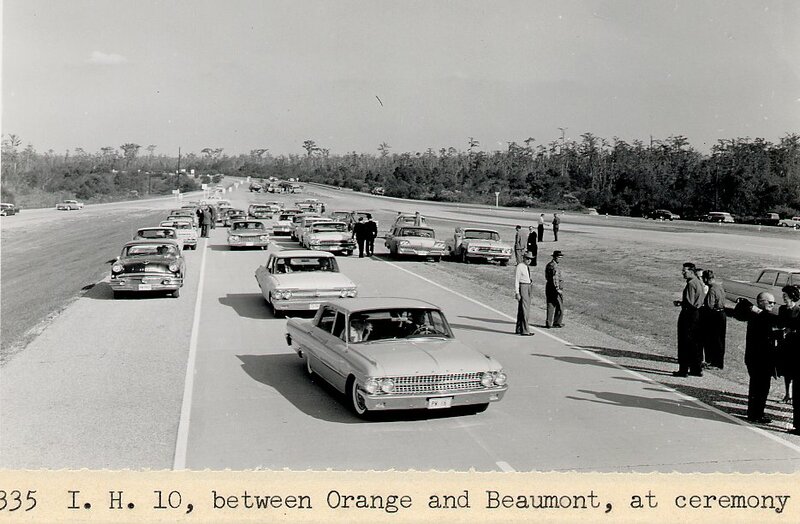 This is now the route of Interstate 10. 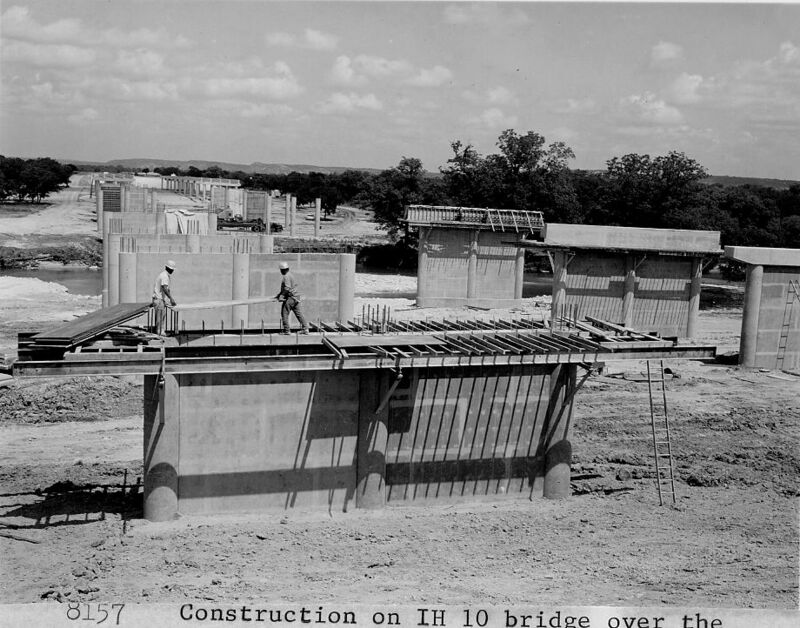 Boerne is about 35 miles northwest of downtown San Antonio. 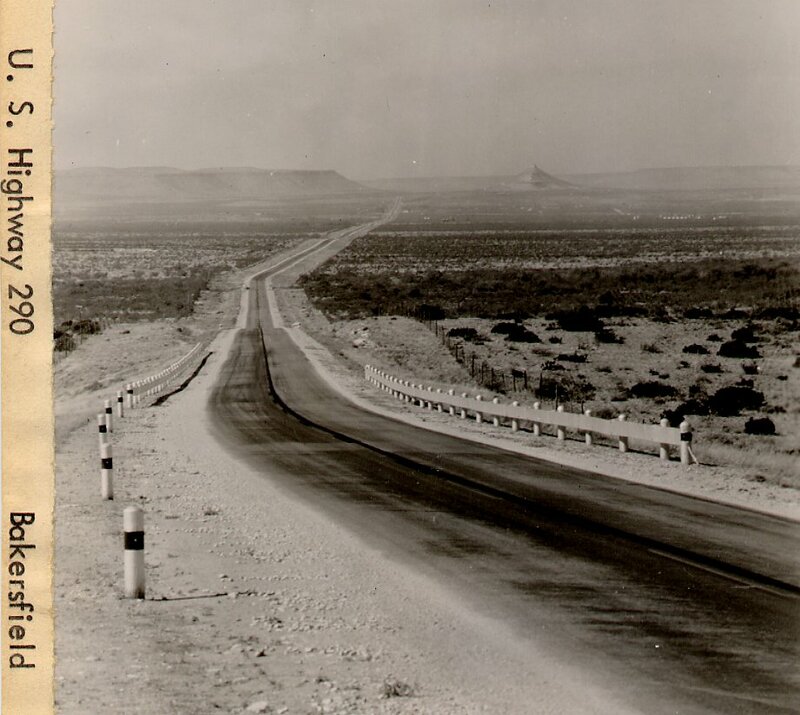 Junction is 100 miles west of San Antonio. Even though this region is semi-arid, notice the wide flood plain. 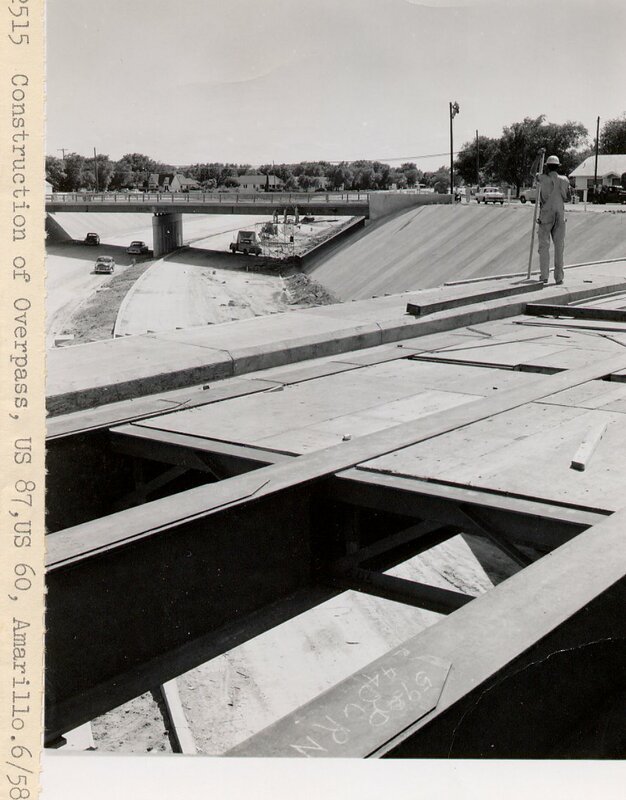 To see what can happen, see Llano River flood photos, November 2000. 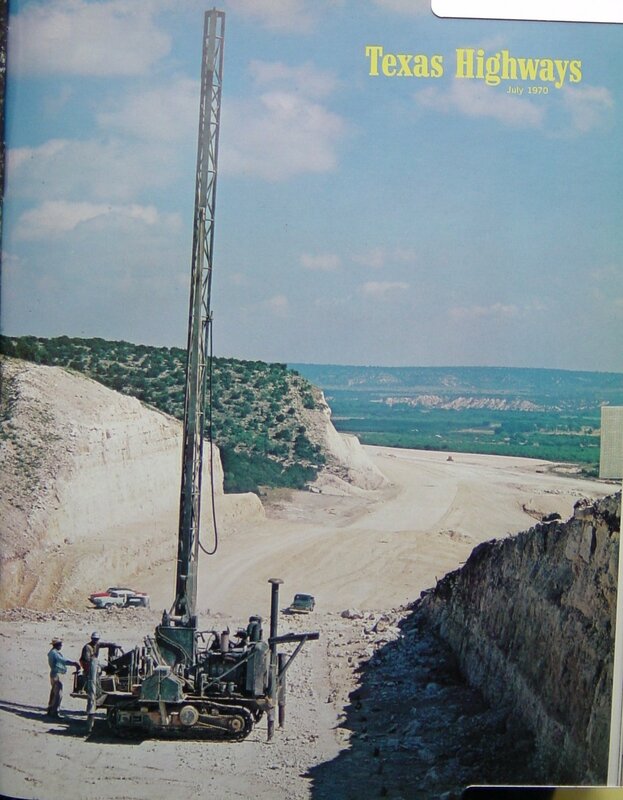 See the Texas Highways Magazine cover image below for a nice color photo. 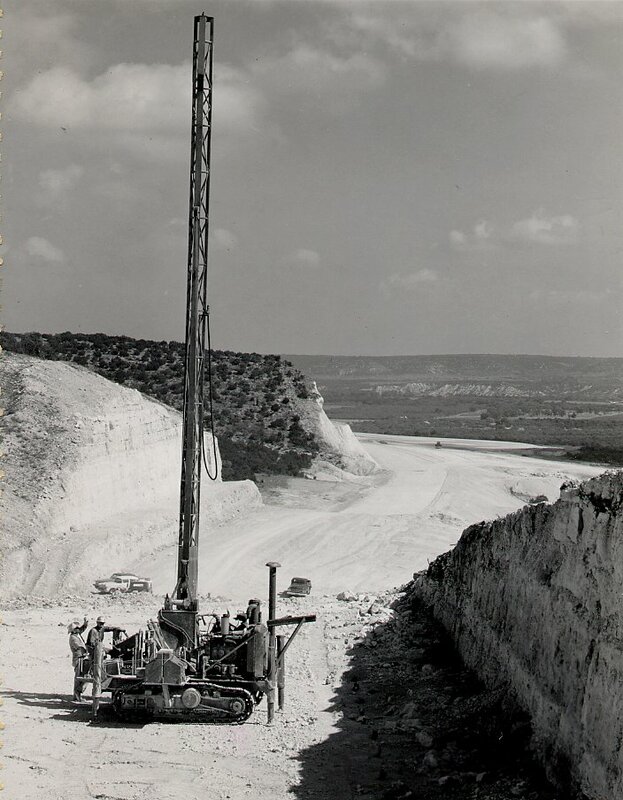 Drilling dynamite placement holes near Junction, TX. This is a nice color photo. Huntsville is about 60 miles north of downtown Houston. 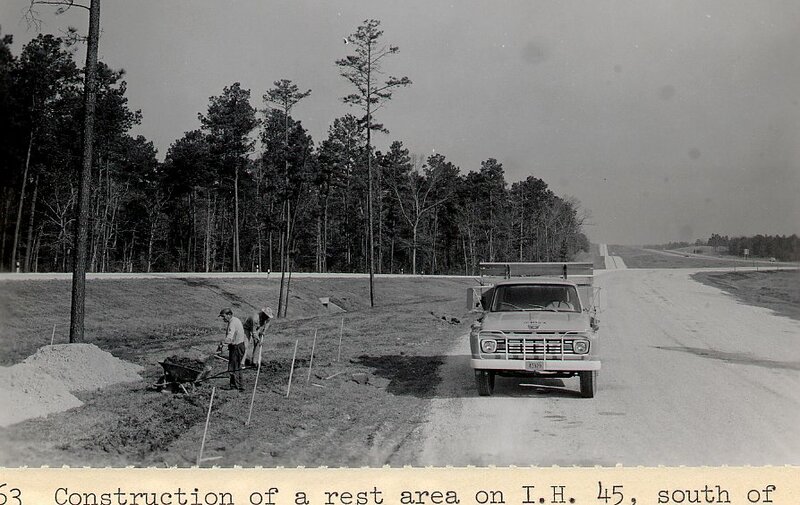 The interstate appears to be complete at Huntsville in 1963. 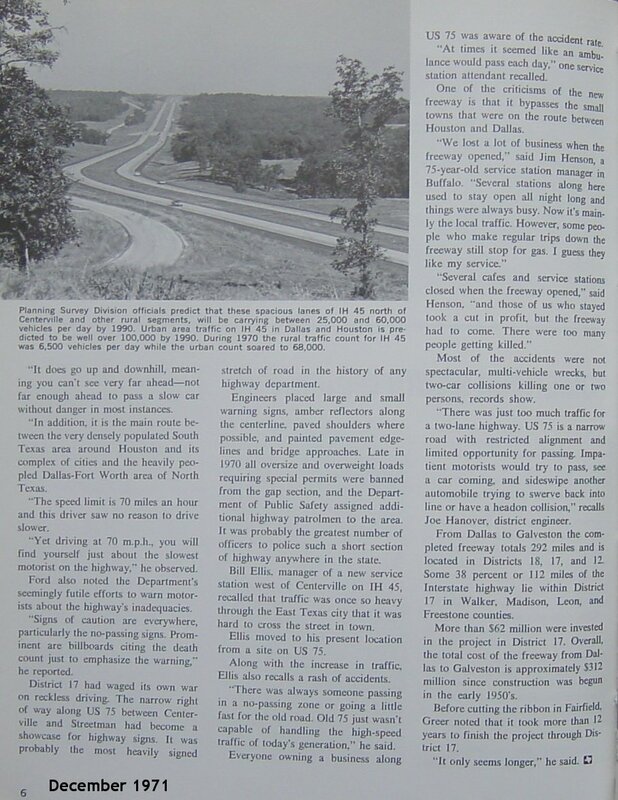 This article features the dedication of the IH-45 section between Centerville and Buffalo on July 11, 1969. 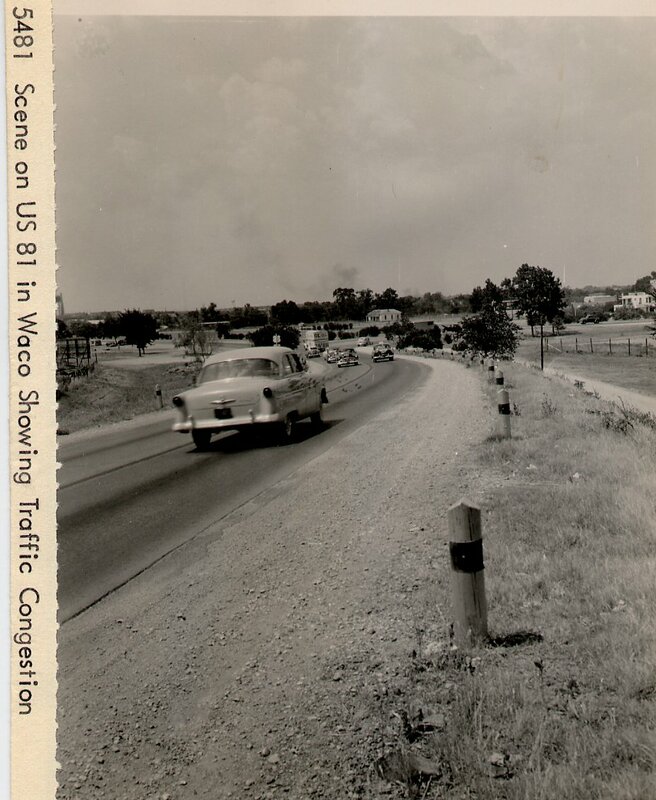 The old US 75 had become very dangerous, as shown by the roadside sign with the fatality count. 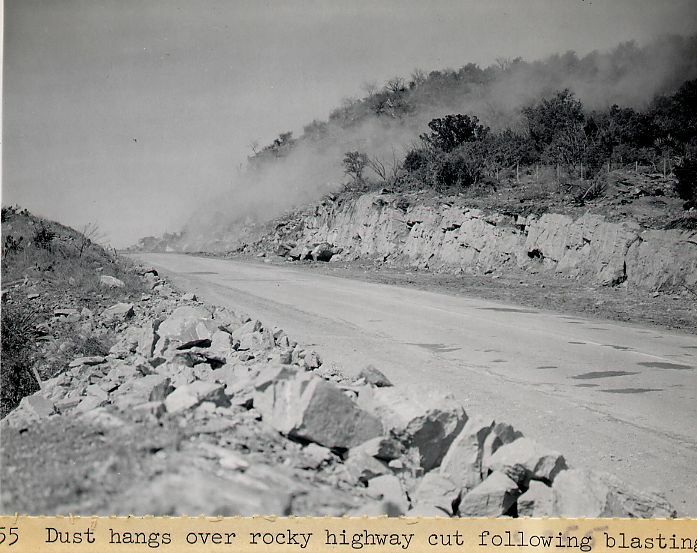 With the completion of this section, 34 miles between Buffalo and Streetman remained to be completed. 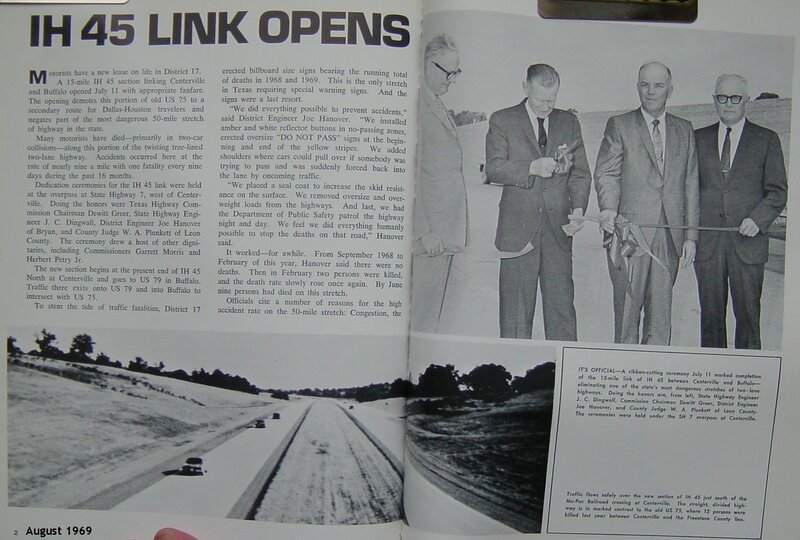 This article features the dedication of the final 12-mile link in IH-45 between Houston and Dallas. 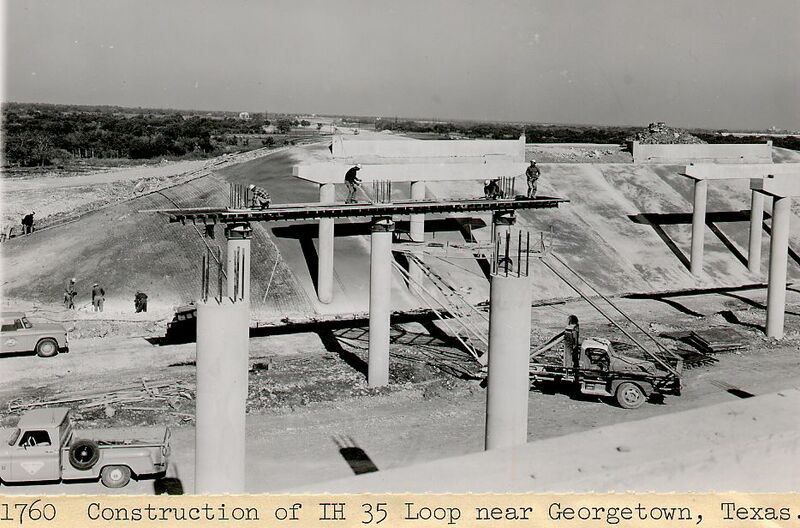 Only a small section in Dallas remained to be completed. 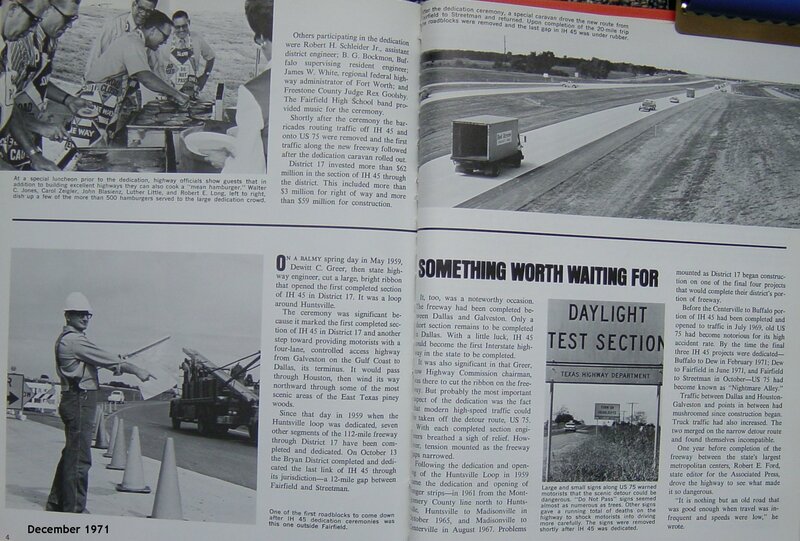 The article describes how the uncompleted section had become known as "Nightmare Alley" due to its high traffic fatality rate. 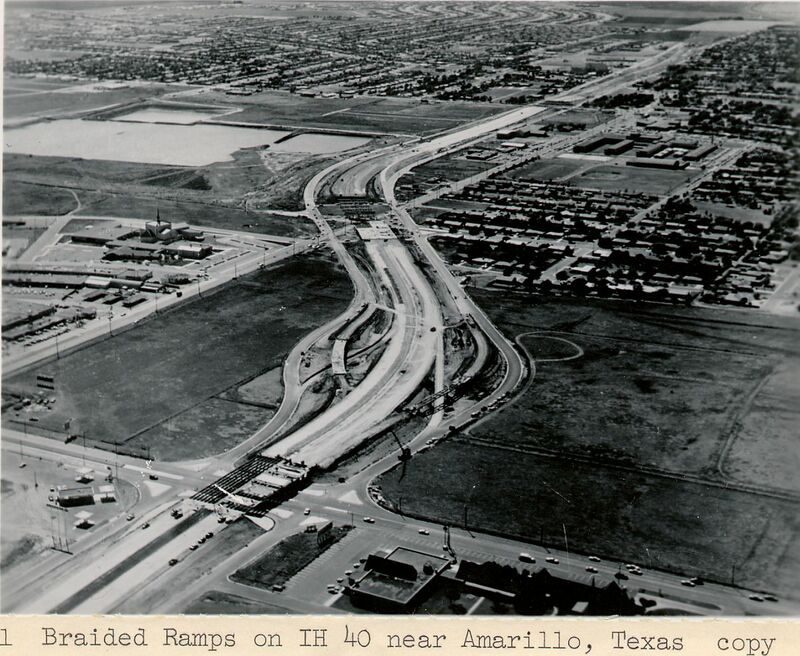 This photo is labelled as being in TxDOT district 10. 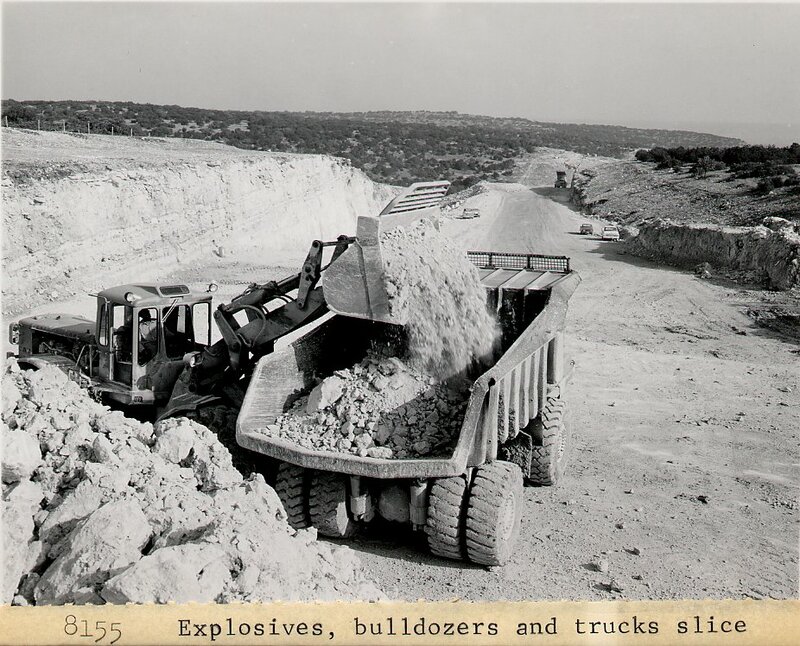 I believe this is the Tyler district. These links also include 2001 views of these locations. 2001 photos contributed by Billy Donovan. Thanks! 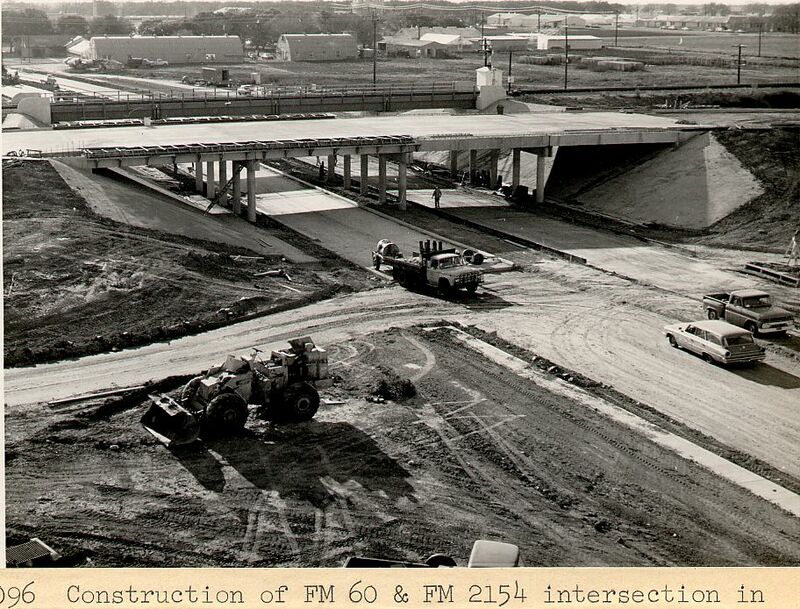 Like most highway completions in the 1960's, this was a big deal. 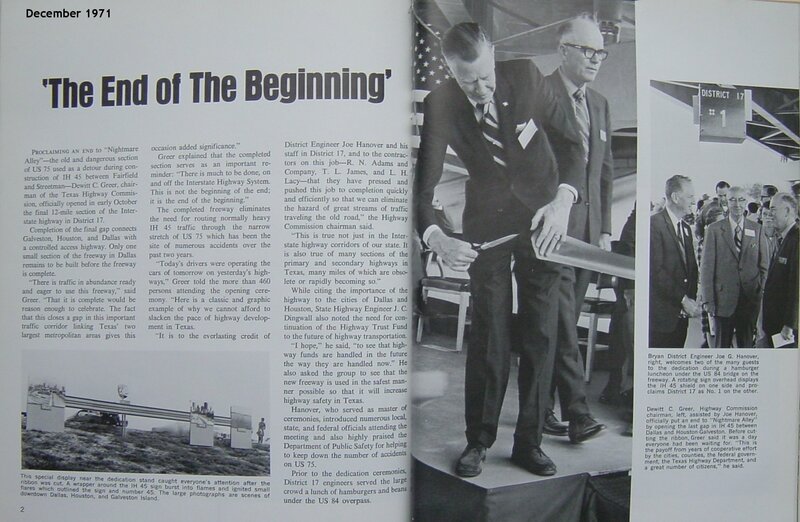 This opening ceremony featured a band and a drill team. 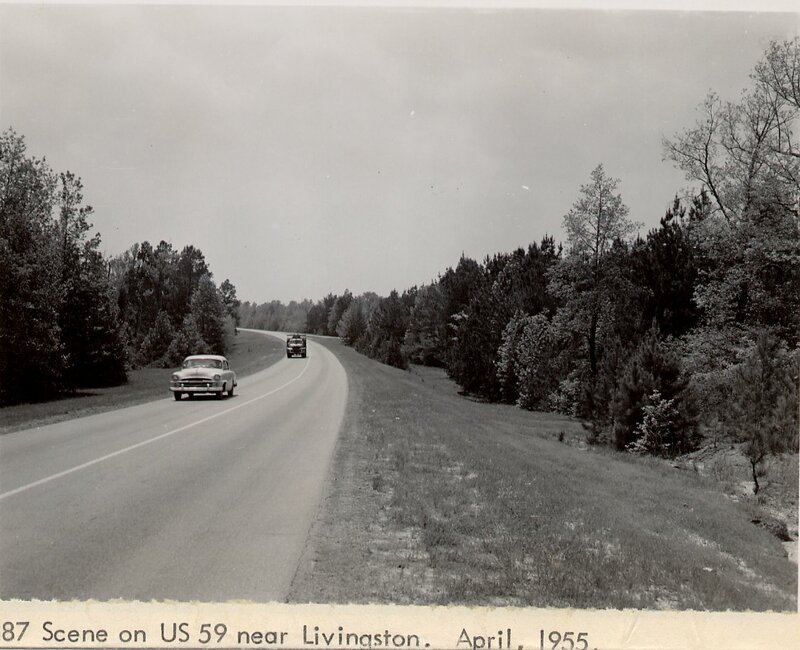 This is the original US 59, before it became a divided highway. 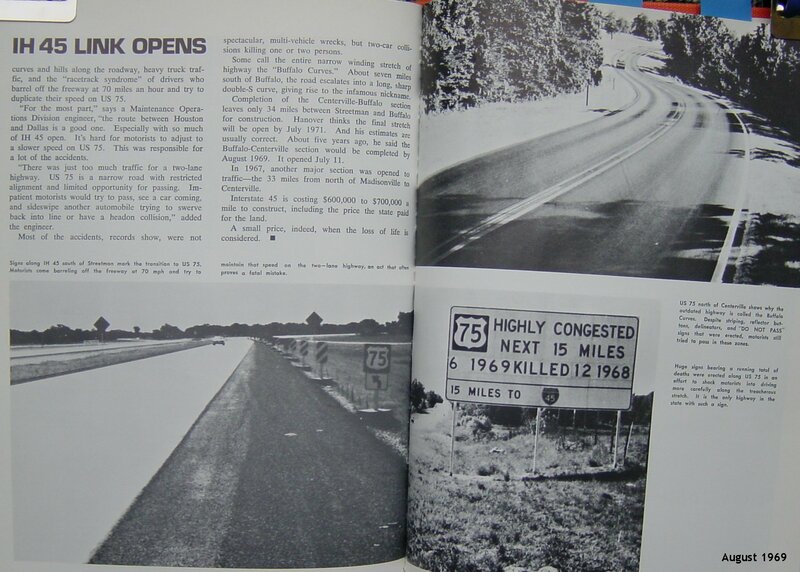 Sometime between 2010 and 2020, Interstate 69 will replace this route as the region's main artery. 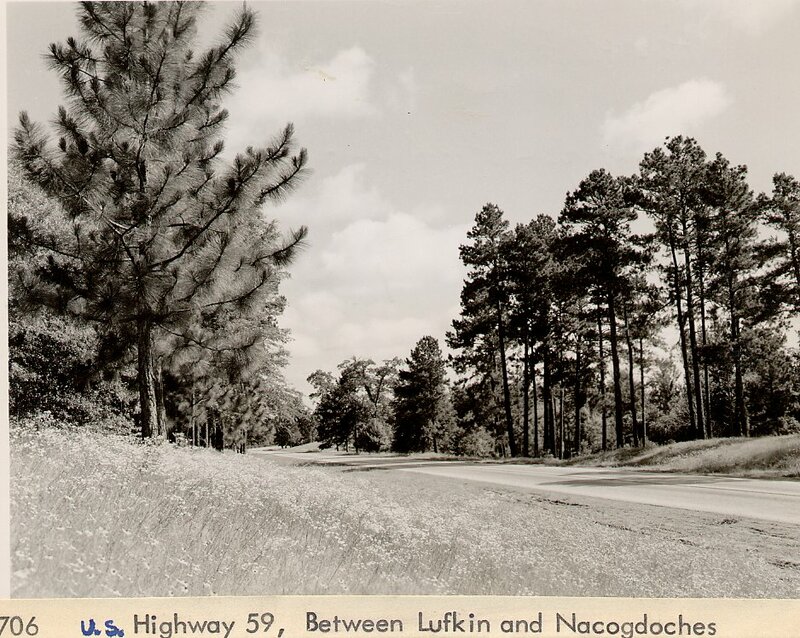 IH-69 will be constructed on new location for most of its route around Lufkin and Navasota. 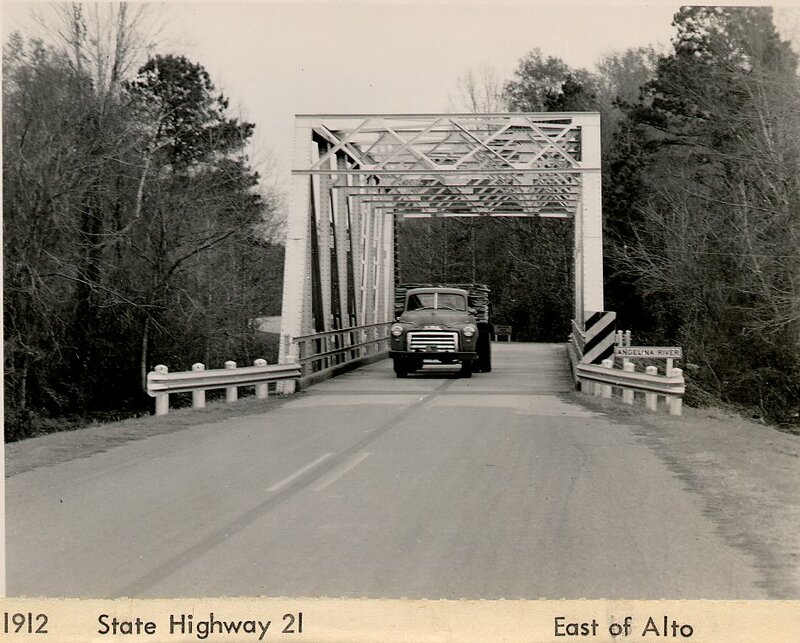 These three photographs of Highway 21 all show old-style truss bridges that existed along this route. 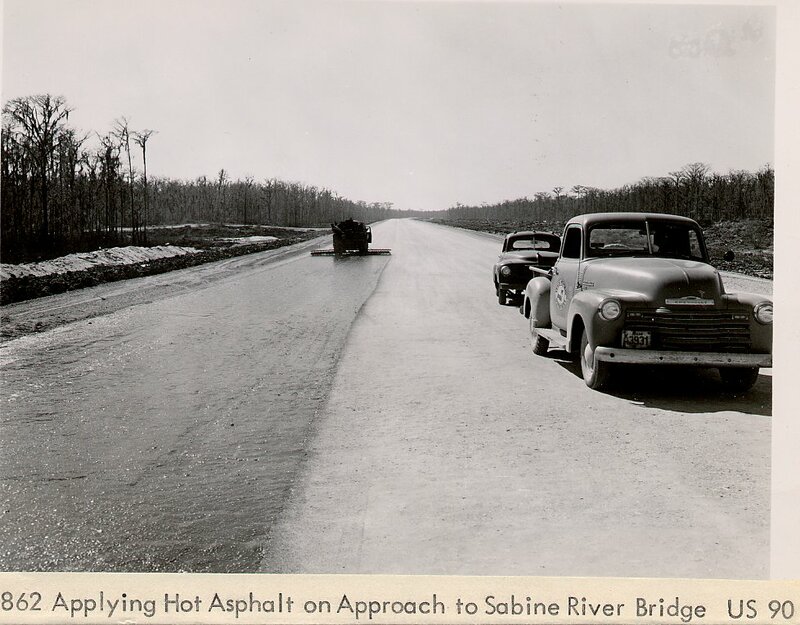 This photo seemed curious to me because the river crossing was such a long structure. 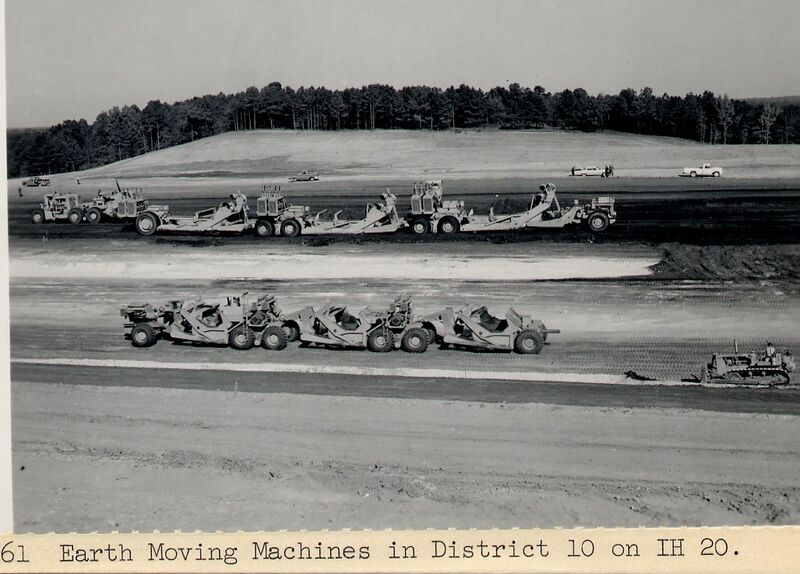 Then I realized that this photo was taken before water impoundment of Lake Sam Rayburn. So the ground in this photo is now underwater. 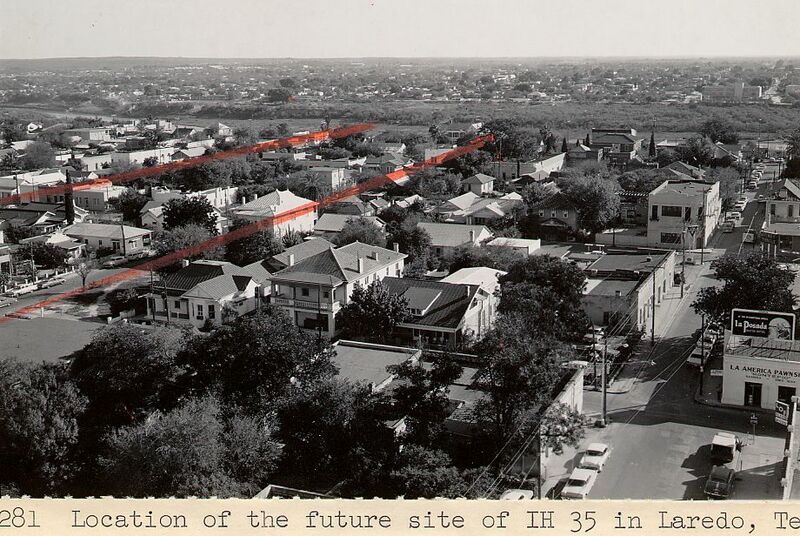 I added this photo for all fellow A&M alumni out there. 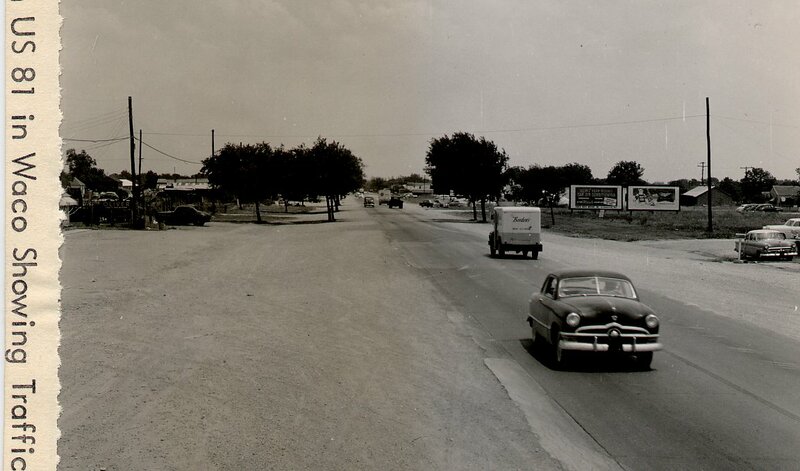 This is the intersection near Northgate and the Dixie Chicken. 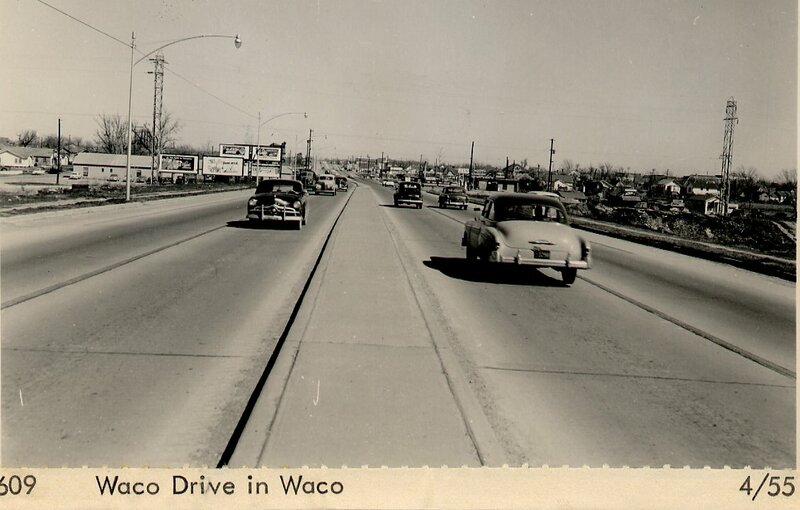 The photos show the original US 81 through Waco, which would later become the Interstate 35 corridor. 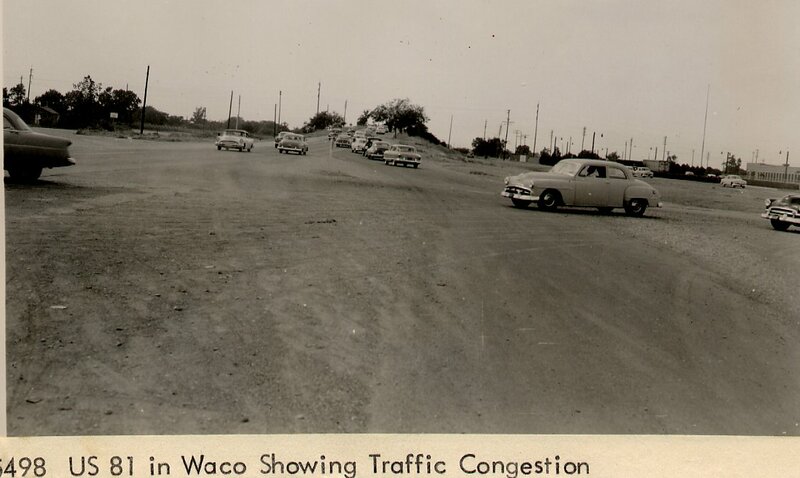 These photos show the roadway lined with 1950's era fuel stations and commercial establishments. 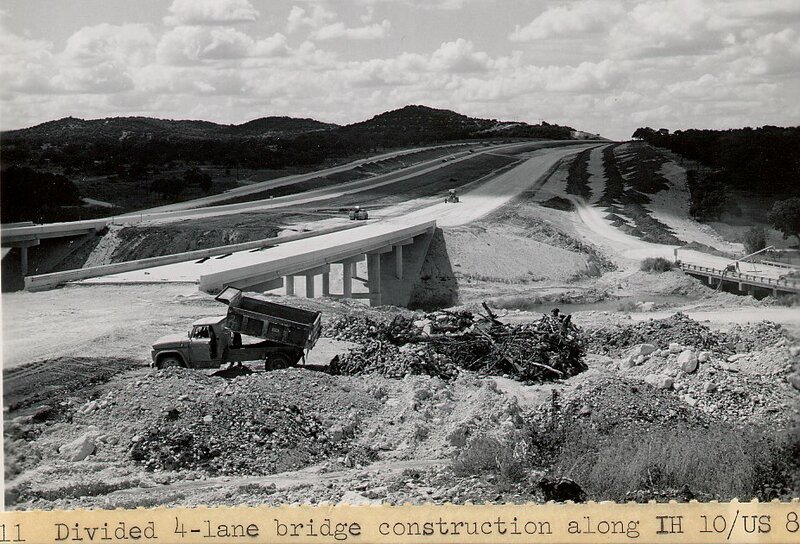 This photo appeared on the cover of Texas Highways magazine, April 1961. 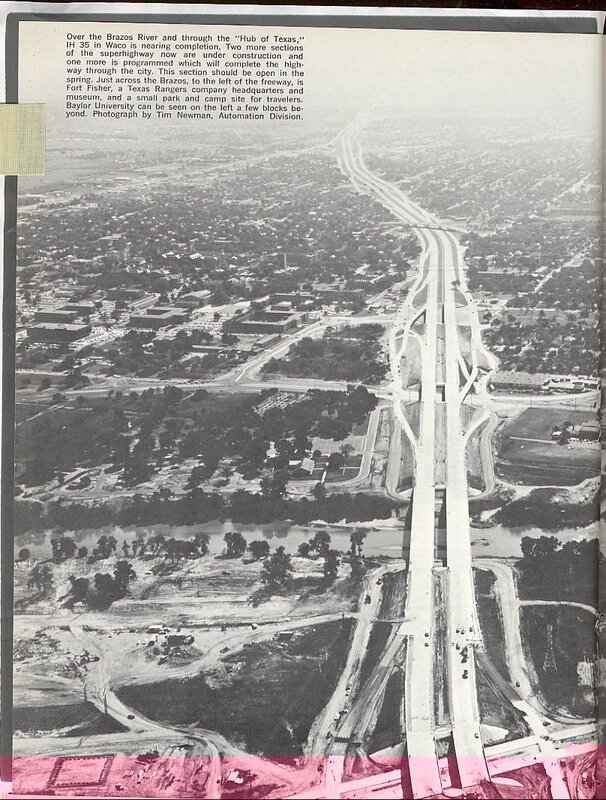 In this model view, the Kell freeway goes from the lower right corner of the image to the upper left. 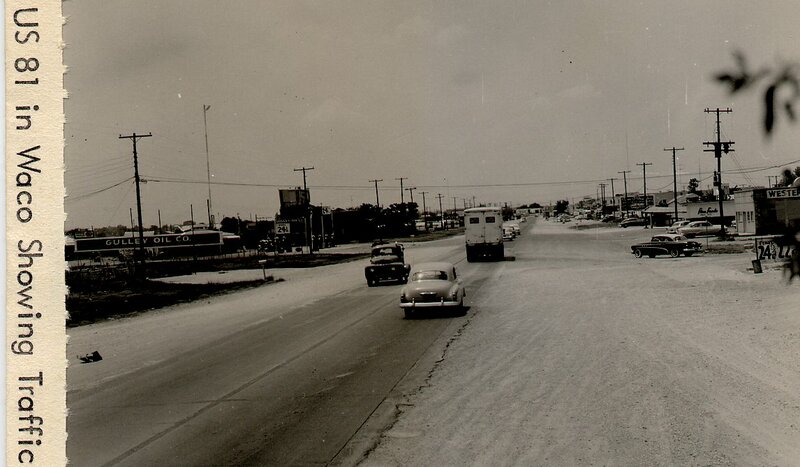 US 287/IH-44 goes diagonally from lower right to the left. 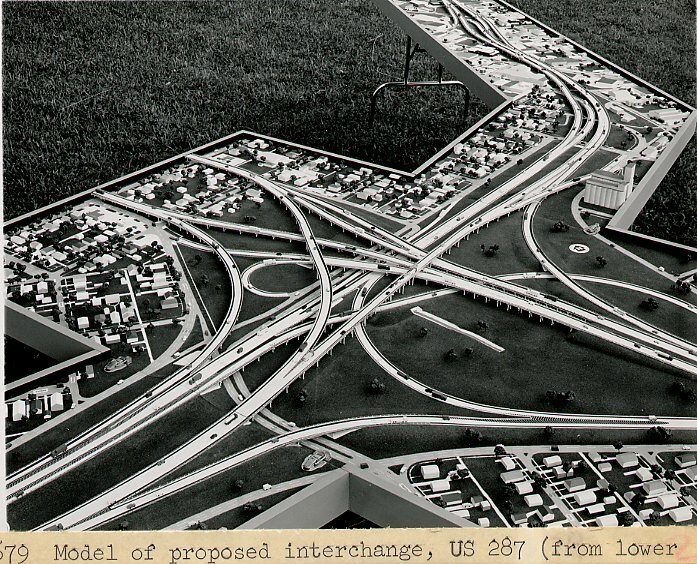 Notice the wide separation of US287/IH-44 on the left side of the model. 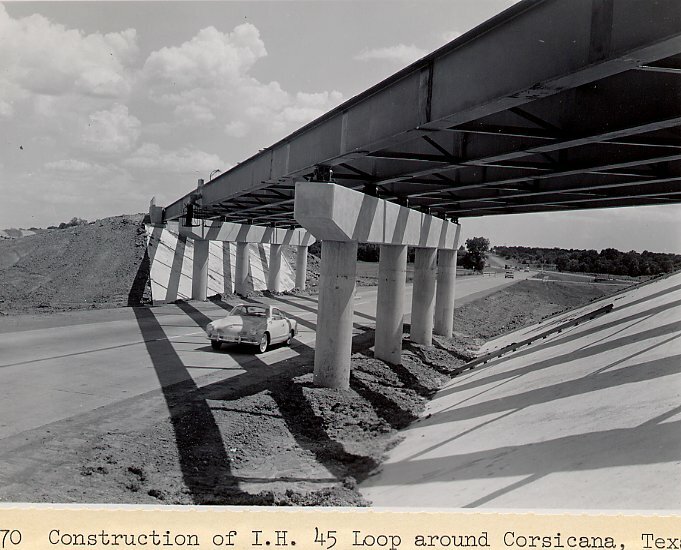 This was the transition to IH-44. 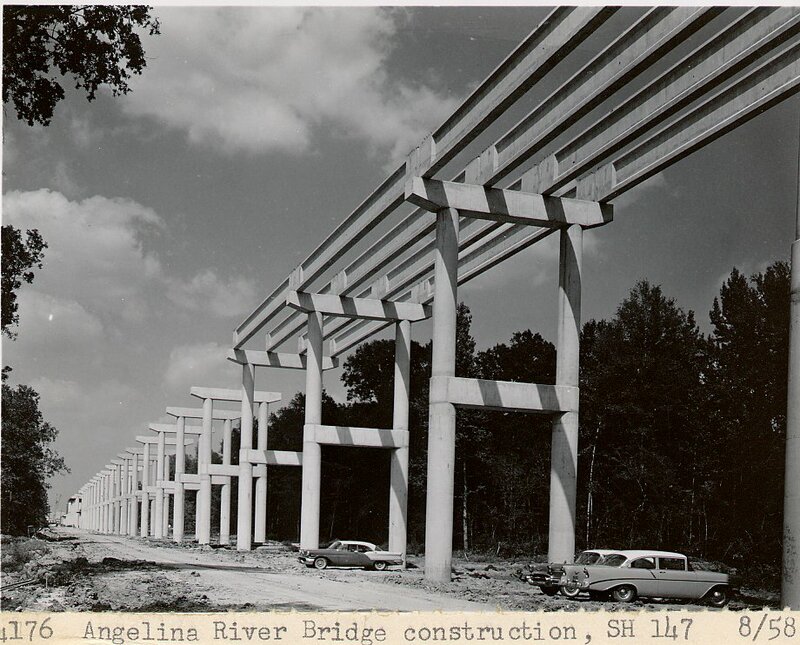 The elevated viaducts for this freeway finally began construction in 1999. 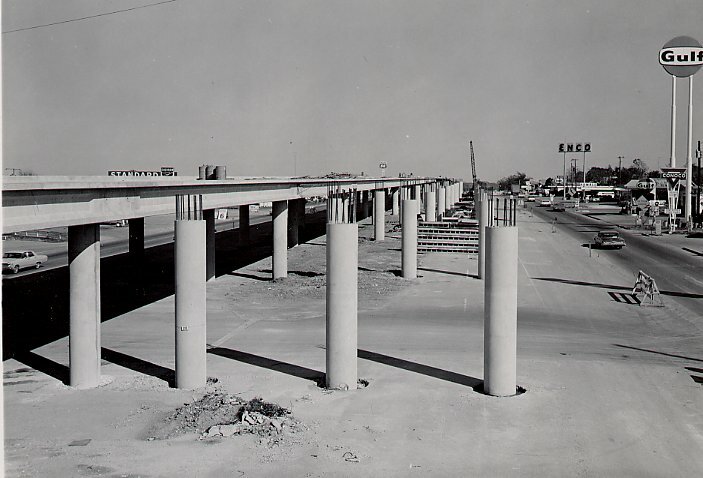 Click here for photos of the construction of the elevated viaduct, taken from the offical TxDOT information page. The connector ramps shown in this model were not constructed.